Go Plumbers Limited are plumbers in West Byfleet offering a wide range of heating and plumbing services in Weybridge, Byfleet, Guildford, Working, Leatherhead and Esher. Their heating engineers from Leatherhead, Guildford and nearby are gas safe registered and have an exceptional reputation locally in Surrey. Go Plumbers Ltd provide the complete range of plumbing and heating services at very affordable prices. They have extensive knowledge of both new installations and complex plumbing repairs. Broken down boiler? Problems with your central heating? Are you looking for a gas engineer near Woking or Guildford? 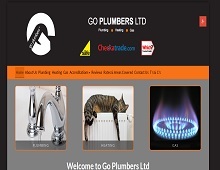 Get in contact with Go Plumbers Limited, Surrey, today for your free quotation.